To celebrate, I'm sharing a little something I've been working on for almost a month now- a crochet hat pattern! This is my first official pattern, so I had to make three hats times to make sure I had it written correctly. But now it's finished and I'm sharing it with all you crocheters out there for free! I would love for some feedback on my pattern, so if you try it out, be sure and let me know how it goes! Or, write me with any questions. This pattern is the property of Elise Engh and is copyrighted. It is for non-profit and personal use only. Please do not redistribute or sell this pattern as your own. · Beginning ch 2 counts as a dc. · Rounds 8,10,12 are worked with the ch 2 and 2 dc as the beginning of the first shell. The final 2 dc are worked in the sl st of the previous row to complete the first shell. · At the end of row 6, the diameter of your hat should be approx. 7 ½ in. · The length of the finished hat should be about 7 ½ inch as well. Round 5: Ch 2, 2 dc in same st as join. * 1 dc in next 3 sts, 2 dc in next st. Repeat from *around. Ending with 1 dc in last 2 sts. Join with a sl st in 1st dc. For Rounds 6-12, join at ch 2 instead of 1st dc. Round 7: Ch 2, skip 2 sts, 5 dc in next st. * Skip 2 sts, 1 dc in next st. Skip 2 sts, 5 dc in next st. Repeat from * around, sl st in top of ch 2. Round 8: Ch 2, 2 dc in same stitch as join. Skip 2 sts, dc in next st, skip 2 sts. *5 dc in next st, skip 2 sts, dc in next st, skip 2 sts. Repeat from * around. End with 2 dc in the sl st of the previous row (to complete the 1st shell). Join with sl st to top of ch 2. Cutie patootie! Thanks again for the chat yesterday. You're amazing! That is so cute. I can't wait to get good enough to make this! Thanks. This is super cute! I have been looking for a project with a new stitch. Pinned this idea. Wow you are amazing! You need to teach me how to read a pattern. Super cute! This hat is so cute. I am pinning to my future crochet projects. Very cute! I have been making a lot of hats lately ,going to need to make this one next! Your hat is really lovely!! So generous of you to share the pattern with the rest of the world, thank you so much! #1. I LOVE YOUR BLOG! #2. I made this hat, using a lime green ww yarn this evening and I LOVE it! I'm thinking of making a hot pink flower to go on the side! #3. Thanks SO MUCH for sharing! You did a great job on this pattern. Very easy to follow, not confusing, just love it. Thank you! love the hats- saw them on pinterest! great work. Love the hats just too cute ! Thank You ! going to have to make some ! Hi, wonderful hat!!!! I am trying to make it now. Question on round 7 how may 5 dc groups do you have when the round is done???? So cute - exactly what I've been looking for - winter is coming too soon! I want to try this with a little brim on it - hopefully it works! Wow! Thanks so much for this pattern. After a few failed attempts with other patterns, yours was the jackpot! Made a great hat with your guidance. Really appreciate that you made this free to the public. The hat turned out darling, thanks to you! Merry Holidays and thanks again! Thats indeed an easy and wonderful pattern.. I tried making hats from different sources but in vain. Your steps were so easy and the hat turned out beautiful.. I wish i could show you the snap of my hat. Thanks a lot! Merry Christmas and a very happy new year to you! Nazani, thank you for letting me know. I can't believe how many people are willing to steal material and sell it as their own. I was able to get the person to shut down that auction on listia. This is super cute! I'd love for you to consider joining our first ever Pattern Party! Those with free patterns to share are invited to link up. Check it out! Sorry you are having trouble with my pattern. I know it's not perfect. I end up with the right number of stitches by joining on the top of the ch 2, but if your are having problems with too many stitches then you can try joining on the first dc instead. It's hard to know where the problem lies without actually looking at your work. I hope that helps you out! Is there a matching scarf pattern for this hat? I made this hat and LOVE it! But where are the instructions for the flower? Rhonda, I'm glad you like the pattern. 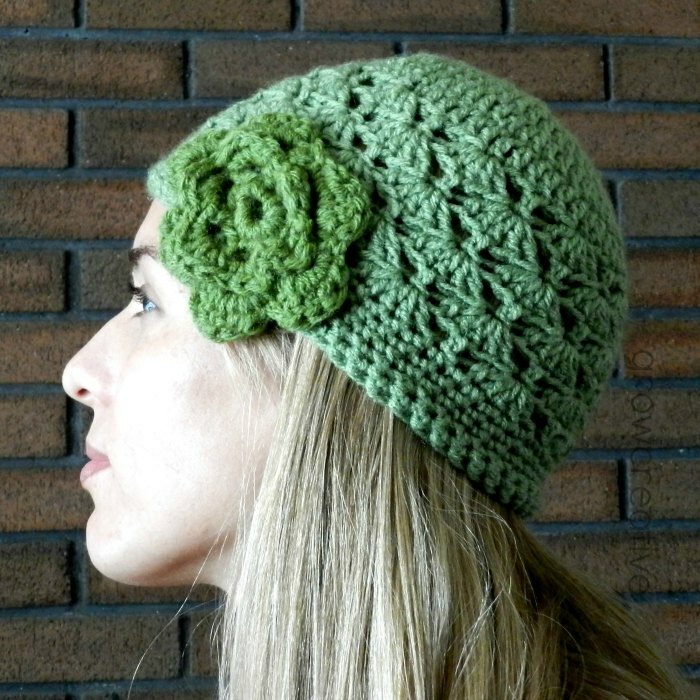 My pattern is just for the hat, not the flower. I linked to the flower pattern in the post... you can find it on Ravelry here: http://www.ravelry.com/patterns/library/cozy-flowered-headband. Mette, Yes I did mean the diameter. Thanks for catching that typo! This is a very cute pattern! I would love to make one for my baby girl, any tips? When would I start the shell pattern? How much yarn did it take to make this hat? Love it . Can't wait to try it!! Should I be skipping 2 spaces before the 5 dc in row 8? Hello! Thank you for sharing this darling hat pattern! I just have a quick question about round 8. AM I supposed to skip 2st between the 5dc and 1dc? After the asterisk it doesn't say to and I ended up with too many stitches to just wanted to check. Thanks!! Yes, do skip 2st there. Thanks for catching my typo! Thank you for designing this pattern. I am making this for a friends mother who just lost all her hair to cancer. I followed the pattern to a T but it came out as a tiny hat, I couldn't even get my 7 year old niece to get it on. How can I make it a bigger hat? This said it would fit a medium women's head. I guess I need like an XL head. Lol. Also, when you start the chain 5 for the shell do you take your needle under all the threads like in the entire hole or just under the two threads at the top and above the one on the bottom? I'm sorry yours turned out so small. Hats are tricky and it might be that you crochet tighter than I do. The type of yarn you use can also make a difference. You could try using a larger hook and see what you get. Good luck! How can I make this a larger hat? Hi, I love the hat but, I am confused for some reason. I've tried it six times and it ends up different every time! On round 5 I have only 1 st. left so I did 2dc into to make 60. Since I'm joining on the first dc it seems to lessen the st count, I think. On rnd 7 I end up with the 1dc at the end of the rnd. Rnd 8 is just wrong. Sometimes the shells stack up rnd to rnd and sometimes the 1 dc is in the middle of previous rnds shell and the current shell is in previous rnds 1dc. Also, when I tried the 2dc in sl st at the end of rnd 8 (which ended with 1dc which seems wrong) I didn't know where to join. Oh, and the shell only has 4 dcs. What am I doing wrong? Are the shells stacked or staggered? In the picture the seem staggered but I don't know. It's strange because I've been crocheting for years! I'm sorry you are having trouble! Without being there, it's hard to know where the problem is. The shells should be staggered from row to row. Love this pattern. I made it in a variegated turquoise/white yarn to match a shell-stitch scarf for my daughter for Christmas. The flower is especially fun to create! Thanjs for designing and sharing. I love this design, and had no problems with the hat but can't begin to understand the terminology, brackets, etc for the flower. I promised this to my granddaughter, please help! Thank you so much! I hope to make this for my granddaughter. THANKS AGAIN! Love this pattern. I'm making hats for a cancer center. I will be making these in every color I can. Thank you for sharing. You're welcome! I'm so glad you are using this pattern to help others! This is such a darling little hat - I’ve made them in different colors for myself, friends, and charity. I use a magic ring to start instead of the extra 2 chains but otherwise follow the pattern exactly with no changes, though I do use a different flower pattern that is more flat. I have had so many compliments on this hat - the assistants in my doctor’s office even wanted to pay me to make it for them. Thank you sooo much for sharing this lovely pattern!! !